Would You Like to Be a Pro Athlete? One-third of the Bible is PROPHECY! Why was it written? Why is it so mysterious? Why does almost no one understand it? Here are the Bible answers! BIBLE prophecy has perplexed millions! Many hundreds of volumes have been written — articles, leaflets, tracts printed — thousands of sermons have been preached — all about Biblical prophecy! And yet — look at all the CONFUSION! Many believe ALL the prophecies have been fulfilled. Others believe the prophecies were merely the pronouncements of wild-eyed fanatics carried away with visions of doom. Still others believe the prophecies are confined to the Old Testament, and are all DONE AWAY. Still others preach that MOST Biblical prophecy is for OUR DAY — NOW! The Hebrew word for prophet, "Nabi" means "one who announces or brings a message from God." The word "prophet" in the English language means essentially the same thing — "one who speaks by Divine inspiration as the interpreter or spokesman of God," whether it be a message of duty and warning, or a prediction of future events. A prophet is one who speaks FOR God; hence, the prefix "pro" (from the Greek language — from which our word "prophet" is derived) which means "for" and "before" so that a prophet is one who speaks FOR GOD, or one who tells BEFORE — one who PREDICTS, foretells, prophecies! Many people falsely ASSUME all prophecies are merely dire foretellings of catastrophic events, of the wrathful vengeance of a harsh God who is about to descend with terrible fury upon His hapless subjects here below! This is FAR from the truth! MANY of the prophecies foretell a time of peace, of happiness, of restoration, of joy, of great prosperity and physical wealth for those who are serving God. MANY prophecies merely foretell, in advance, certain events which are to happen, the rise and fall of nations, the COURSE of world affairs! Prophecy IS a chronicle of the great PLAN God is working out here below! It describes this plan in DETAIL, showing how God KNEW it would work out, according to human nature, together with other SPECIAL INTERVENTIONS of God. Prophecy is HISTORY WRITTEN IN ADVANCE! The prophets were not a special hierarchy, a guild, or a certain "class" of men! Many of them were chosen from various of the tribes, and, unlike those of the tribe of Levi, were not BORN into their office. "... The prophecy came not in old time by the WILL OF MAN, but holy men of God spake as they were moved by the Holy Spirit" (II Pet. 1:21). DANIEL was a Jew, of the tribe of Judah, one of the PRINCES of the nation, with whom God began to deal — revealing the meaning of Nebuchadnezzar's dreams, and causing Daniel to write many prophecies which he, himself DID NOT UNDERSTAND! (Dan. 12:8-9). JEREMIAH was "of the priests" (Jer. 1:1), who argued he was TOO YOUNG to become a prophet of God! HOSEA was apparently of Zebulun, JONAH ran from the call of God, ISAIAH claimed he was a man of UNCLEAN LIPS, and didn't want to prophesy, and ZEPHANIAH was one of the princes of Judah, possibly of the descendants of Hezekiah. As the Holy Spirit inspired Peter to write, God CALLED His prophets — sent them with a message as divinely commissioned MESSENGERS. On many occasions, they had to be MADE WILLING to carry the message of God. These men WERE NOT SEEKING for some kind of a "spiritual experience," they were not earnestly DESIRING the office of a "prophet," they were CHOSEN of God! Notice the way God called Amos! "The words of Amos, who was among the HERDSMEN Tekoa, WHICH HE SAW" (Amos 1:1). Amos was going about his daily life, AMONG THE HERDSMAN, minding his own business — and God expressly REVEALED a certain message to him. Later, when Amos was approached by Amaziah, the priest of Bethel, who told Amos not to prophesy, but to go into another country, Amos answered "... I was no prophet, neither was I a prophet's son, but I was AN HERDMAN, and a gatherer of wild figs [margin] and the Eternal took me AS I FOLLOWED THE FLOCK, and the Eternal said unto me 'Go, PROPHESY unto My people Israel'" (Amos 7:14-15). Amos was HERDING SHEEP — NOT "looking" for some kind of "religious experience" — and God CALLED him! Who were the prophets? They were princes, sheepherders, farmers, fishermen, or priests. They came from many different tribes, and God called them at many different times. Your Bible says that they were "HOLY men of old"! And, ON THESE MEN together with the New Testament apostles, is based the very CHURCH OF GOD! "Now therefore ye are no more strangers and foreigners, but fellow citizens with the saints, and of the household of God, and ARE BUILT upon the FOUNDATION of the apostles AND PROPHETS, Jesus Christ Himself being the chief cornerstone" (Eph. 2:19-20). God selected Jonah as a prophet and, after making him WILLING to carry the message of God, commissioned him to go to the great city of Nineveh. Jonah finally went. Jonah prophesied, lifting up his voice in loud warning as he traversed the great, sprawling city of Nineveh! Finally, the word came to the king. The king realized the SERIOUSNESS of the prophecy, and "... arose from his throne, and he laid his robe from him, and covered him with sackcloth, and sat in ashes. And he caused it to be proclaimed and published through Nineveh by a decree of the king and his nobles saying, 'Let neither man nor beast, herd nor flock, taste anything. Let them not feed, nor drink water. But let man and beast be covered with sackcloth, and cry mightily unto God'... and God SAW THEIR WORKS that they turned from THEIR EVIL WAY, and God repented of the evil, that He had said that He would do unto them, and He did it not" (Jonah 3:6-10). Notice it! Jonah fulfilled HIS COMMISSION! Jonah's job of orally shouting the warning was over! Jonah had been made willing, HAD CARRIED THE MESSAGE to Nineveh, and Nineveh had actually REPENTED! Then — if the prophecy had served its purpose, if the warning had been heeded, if Jonah's commission was over, WHY THE NEED OF WRITING THE PROPHECY? Jonah WROTE the whole thing, and it forms a part of your Bible today! Again, notice the 36th chapter of Jeremiah. "And it came to pass in the fourth year of Jehoiakim the son of Josiah king of Judah, that this word came unto Jeremiah from the Eternal, saying, 'Take thee a roll of a book [a scroll], and write therein all the words that I HAVE SPOKEN unto thee against ISRAEL, and against Judah, and against all the nations... it may be that the house of Judah will hear of all the evil which I purpose to do unto them, that they may return every man from his evil way'... then Jeremiah called Baruch the son of Neriah, and Baruch WROTE from the mouth of Jeremiah all the words of the Eternal, which He had spoken unto him, upon a roll of a book!" (Jer. 36:1-4). After the writing of this dire warning toward Israel and Judah, notice what happened! "Jeremiah commanded Baruch, saying, 'I am shut up, I cannot go into the house of the Lord: therefore go thou, and READ in the roll, which thou hast written from my mouth, the words of the Eternal in the ears of the people in the Eternal's house upon the fasting day... It may be they will present their supplication before the Eternal, and will return every one from his evil way...' and Baruch the son of Neriah DID according to all that Jeremiah the prophet commanded him, READING in the book the words of the Eternal in the ETERNAL'S house" (v. 5-8). The people heard it, and also one of the princes who was present. He carried the message to other princes, whereupon they sent Jehudi (v. 14) to tell Baruch to come to them. He arose, took the scroll in his hand and began to read it to them. They then TOLD THE KING (v. 20). Now notice what happened! "So the king sent Jehudi to fetch the roll, and he took it out of Elishama the scribe's chamber. And Jehudi READ IT in the ears of the king, and in the ears of all the princes which stood beside the king. Now the king sat in the winter house in the ninth month, and there was a fire on the hearth burning before him. And it came to pass, that when Jehudi had read three or four leaves [columns] he cut it with the penknife, and cast it into the fire that was on the hearth, until ALL THE ROLL WAS CONSUMED in the fire that was on the hearth" (v. 21-23). The king then commanded (v. 26) that Baruch and Jeremiah be seized. However, they escaped, being hidden of God. Stop and think for a moment. God had revealed a message to Jeremiah. Jeremiah had caused the message to be WRITTEN. The message had then reached ALL THE PEOPLE. Then ALL THE PRINCES heard it. Finally, it reached the KING! On this occasion, unlike Nineveh, neither the king, the princes, nor the people repented! However, the purpose of the prophecy was FULFILLED — wasn't it? Everyone had HEARD, orally, the EXACT WORDS of this amazing prophecy READ IN THEIR OWN EARS! But — IF the whole purpose of this prophecy had ALREADY BEEN FULFILLED, and if there was not a DUAL application — if there was not yet a FUTURE fulfillment of this prophecy — THEN WHY DID GOD CAUSE EVERY WORD TO BE WRITTEN THE SECOND TIME? "Then the word of the Eternal came to Jeremiah, AFTER that the king had burned the roll, and the words which Baruch wrote at the mouth of Jeremiah, saying, 'Take thee again ANOTHER ROLL, and write in it ALL THE FORMER WORDS that were in the FIRST roll, which Jehoiakim the king of Judah hath burned'" (Jer. 36:27-28). Do you see? God caused every single word and other words besides to be WRITTEN the second time! He caused Jonah to WRITE the prophecy even though the city repented. GOD WANTED THESE WORDS PRESERVED! God wanted them to come right on down to our time — NOW! The very PURPOSE for WRITING one single word of prophecy is to PRESERVE the prophecies for future generations! God saw to it, even by intervening in a Divine miracle, that His sacred words were to be PRESERVED to all generations. Here's PART of the reason: "Now these things were OUR EXAMPLES, to the intent we should not lust after evil things, as they also lusted" (I Cor. 10:6). God caused these prophecies to be written for our examples, TODAY! "Now ALL THESE THINGS happened unto them for examples, and they are WRITTEN for OUR ADMONITION, upon whom the ends of the world are come" (I Cor. 10:11). God caused the prophecies to be written to SHOW His servants how world conditions would work out. "The Revelation of Jesus Christ, which God gave unto Him, to SHOW UNTO HIS SERVANTS things which must shortly come to pass, and He sent and signified it by His angels unto His servant John" (Rev. 1:1). Why? So His servants in THIS modern age can come to UNDERSTAND the prophecies, PREACHING and PUBLISHING them to the modern nations for whom they were intended! READ EZEKIEL 33! God makes an ironclad promise that He will NOT cause any major world condition to occur, that He will not intervene in world affairs, unless HIS SERVANTS — those who are members of the very body of Jesus Christ — know about it FIRST! "Surely the Lord Eternal WILL DO NOTHING but He REVEALETH His secret unto His servants the prophets" (Amos 3:7). One full third of the Bible is prophecy — and about 90% of all that prophecy still pertains to OUR DAY — RIGHT NOW! Notice what happened to Ezekiel! "... I was among the CAPTIVES by the River of Chebar... and I saw visions of God": (Ezek. 1:1). READ the first chapter of Ezekiel! Here is a picture of the very throne of the One who later became Jesus Christ! Ezekiel saw a great whirlwind (v. 4) in the midst of which were four living creatures (v. 5), carrying, over their heads, an expanse of translucent material (v. 22) the color of glass, or crystal. On this expanse of beautiful, crystal-like material, was a throne! (v. 26). Seated on the throne was One "as the appearance of a man above upon it, and I saw as the color of amber, as the appearance of fire round about within it, from the appearance of His loins even upward [compare with Rev. 1:13-16] and from the appearance of His loins even downward, I saw as it were the appearance of fire, and it had brightness round about... THIS WAS THE APPEARANCE OF THE LIKENESS OF THE GLORY OF THE LORD!" (Ezek. 1:26-28). Ezekiel then heard a voice (chapter 1:28) and the voice said, "Son of man, stand upon thy feet, and I will speak unto thee... and He said unto me, 'Son of man, I send thee to the children of Israel... I do send thee unto them, and thou shalt say unto them THUS SAITH THE LORD ETERNAL'" (Ezek. 2:1-4). Ezekiel was being sent with a message by the Eternal, the LORD of the Old Testament — who IS Jesus Christ of the New Testament! But Ezekiel was IN CAPTIVITY. He was sent to the House of Israel! He was also given prophecies against the Ammonites (25:2), against Moab (25:8), against Edom (25:12), against the Philistines (25:15), against Tyre (26:2-3). Against Egypt (29:2) — and against other nations, a great distance from his location in Babylon. But Ezekiel WAS IN CAPTIVITY. The word of the Eternal came to him, giving him these messages — commissioning him to warn these specific nations! But Ezekiel WAS NEVER RELEASED to GO to these nations! Imagine it! Picture, if you can, a young Jewish lad in a concentration camp in Germany, during World War II. Let's suppose Almighty God reveals to him startling visions, symbolizing what is to happen to Egypt, Japan, Great Britain and the United States! God tells him to "get you unto Egypt, Japan, Britain and the United States." Are his German captors going to BELIEVE he has received such a message? Even if they DID — is it feasible they would LET HIM GO, in order to travel all about the world during a time of warfare, reaching the leaders of these nations? Even if he COULD feasibly travel from place to place, is it possible anyone with such a message, claiming to be a prophet sent from God, would be ushered right into the White House of the President of the United States, into the Imperial Palace in Tokyo, or to No. 10 Downing Street in London? EZEKIEL NEVER REACHED THESE NATIONS! Instead, he WROTE the prophecies! Do you realize that Ezekiel, a young captive Jew, in a veritable "concentration camp" in Babylon, was given prophecies toward ISRAEL over 120 years AFTER ISRAEL HAD ALREADY GONE INTO A CAPTIVITY? And that He NEVER REACHED the Israelites with the message? Ezekiel saw visions of impending destruction upon Israel "in the fifth day of the month, which was the fifth year of KING JEHOIACHIN'S CAPTIVITY" (Ezek. 1:2-3). Jehoiachin went into captivity in 596 B.C. The fifth year brings us to about 592 B.C., or over 125 years AFTER the removal of the last of the remaining Northern tribes, 718-721 B.C.! If you have not yet seen the startling identity of Israel PROVED, write immediately for Mr. Armstrong's booklet "The United States and the British Commonwealth in Prophecy!" Ezekiel's prophecy NEVER, IN ALL HISTORY until NOW, reached the ears of the nations, peoples, or kings for whom the messages were intended! Rather, Ezekiel WROTE these amazing prophecies! He wrote them — because God was intending to PRESERVE THEM — for our day! Prophecy is DUAL! Notice the THEME of duality running throughout the Bible. There was the first man Adam, and the second Adam, who was Christ (I Cor. 15:45-47). There is the Old Testament, and the New Testament. There was the Old Jerusalem and a new heavenly Jerusalem. Study Matthew 24! Here, Jesus answered the questions of the disciples about the END OF THE AGE, and His imminent return! Many believe Matthew 24 was totally FULFILLED in 70 A.D. at the destruction of Jerusalem. This is entirely baseless! They must believe, by this assumption, Jesus was a liar! But Christ DID NOT LIE — what happened in part in 70 A.D. was merely a FORERUNNER, a former TYPE of the REAL FULFILLMENT of ALL the prophecies of Matthew 24! Ezekiel's prophecies are also DUAL! And the real, LITERAL fulfillment of the prophecies of Ezekiel are right ahead of us — Now! There are definite KEYS to the understanding of Biblical prophecy. Most have never understood what those keys are! The keys to prophecy have become lost! Of GREAT importance is the modern IDENTITY of the nations mentioned in Bible prophecy. Also, in ancient times, when a prophet of God came to a king (such as Nineveh) the message was sometimes BELIEVED, and a great REFORM effected. From time to time, as God sent judges, and prophets, there were certain REFORMS carried out in Israel. At least SOME kings of Israel RECOGNIZED these prophets spoke, NOT according to their own cleverly devised human reasoning, but according to the Divinely inspired WORDS OF GOD! Notice how totally DIFFERENT we are today! YOU KNOW national leaders today would look upon preaching the prophecies of WHAT GOD SAYS IS GOING TO HAPPEN as mere fanaticism. They would spurn, scorn, ridicule and scoff at any MENTION of "Biblical prophecy." Today, PROPHECY seems to be a weird, fanatical sort of "religious ax-grinding," having no bearing on actual fact or present-day world conditions. What a SHOCK lies ahead for world leaders! YOU CAN understand Biblical prophecy. Here's how: God told Daniel the words which he had received were CLOSED and SEALED — but only UNTIL a certain time. Read it! "And he said, 'Go thy way, Daniel: for the words are closed up and SEALED TILL the TIME OF THE END! Many shall be purified, and made white, and tried, but the wicked shall do wickedly: and none of the wicked shall understand; but the WISE SHALL UNDERSTAND'" (Dan. 12:9-10). Who are the "wise"? God says "the FEAR OF THE ETERNAL is the BEGINNING of knowledge" (Prov. 1:7). Wisdom comes from God! "For the Eternal GIVETH wisdom, out of His mouth cometh knowledge and understanding" (Prov. 2:6). The way to get wisdom — to come to UNDERSTAND the Bible prophecies — is to FEAR (be in AWE of) Almighty God! "Thus saith the Eternal, The heaven is My throne, and the earth is My footstool: where is the house that you build unto Me? and where is the place of My rest? For all those things have Mine hand made, and all those things have been, saith the Eternal: but to THIS MAN will I look, even to him that is poor and of a contrite spirit, and TREMBLETH at My word!" (Isa. 66:1-2 ). The mere BEGINNING of wisdom is to fear God. Next, one must learn to RESPECT, to FEAR, to TREMBLE before the Divinely inspired WORD OF GOD! Today people say, "Well, I know the Bible says that — but here's the way I look at it!" People do not seem to really FEAR to misapply, to misinterpret, wrest, distort and twist the sacred word of God! People do not really RESPECT the Divinely inspired words of Almighty God! That's why people don't understand the Bible! You can come to understand the Bible, and Biblical prophecy, ONLY when you begin to really FEAR and RESPECT WHAT THE BIBLE SAYS! The apostle Paul said, "The natural man receiveth not the things of the spirit of God, for they are foolishness unto him, NEITHER CAN HE KNOW THEM, BECAUSE THEY ARE SPIRITUALLY DISCERNED" (I Cor. 2:14). The disciples of Jesus Christ couldn't even understand the simplest parables which Jesus taught them privately! However, AFTER they had been CONVERTED, AFTER they had received the Holy Spirit of God, then they UNDERSTOOD! It is only when one has truly come to fear God, to OBEY God, has REPENTED, and received God's Holy Spirit, that true UNDERSTANDING of the prophecies of God can come. What Prophecy Means to You! Jesus Christ commissioned His Church to preach the gospel of the kingdom of God to all the world as a WITNESS (Matt. 28:18-20; Matt. 24:14). The gospel is prophetic! It has to do with present-day world news, and the FUTURE of this whole earth! The WHOLE MEANING of the gospel is PROPHETIC. Jesus Christ said, "WATCH ye therefore, and pray always, that you may be accounted worthy to ESCAPE all these things WHICH SHALL COME TO PASS [that are PROPHESIED — that are to happen in the FUTURE] and to stand before the Son of Man!" (Luke 21:36). 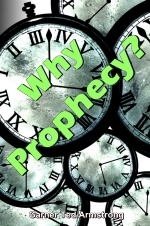 You need to come to UNDERSTAND prophecy! Only by understanding the PROPHECIES of the Bible can you intelligently WATCH — and Jesus meant watch WORLD NEWS. When you KNOW, IN ADVANCE, what is GOING to happen — then you can be a real watchman of Almighty God! That's WHY God caused the prophecies to be recorded — to WARN the world Now! Keep reading the "Plain Truth" magazine! Don't miss a single "World Tomorrow" program! Write for EVERY booklet you hear advertised! STUDY YOUR BIBLE — PRAY for God to give you an obedient, humble, submissive mind — giving you more and more a deep, respectful, AWE of the word of God! You can't afford NOT to — your very LIFE — your FUTURE is at stake!